Scilla is a beautiful seaside village located in the province of Reggio Calabria. Scilla's coastline lies at the end of the Straight of Messina, a narrow sea passage between Calabria and Sicily linking the Tyrrhenian to the Ionian Sea. 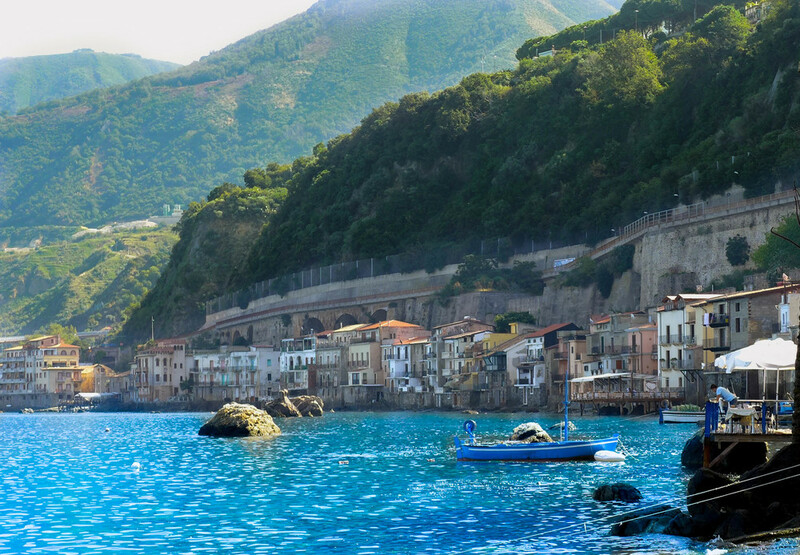 The waters that caress the shores of Scilla have a mystical past. According to stories in Greek mythology, Scylla was a beautiful sea goddess whom the sea god Glaucus fell in love with. Glaucus desperately wanted Scylla to return his love so he went to visit a witch name Circe to ask her to cast a love spell on Scylla. Circe became jealous of the love Glaucus had for Scylla and instead cursed the beautiful sea goddess turning her into a six headed monster and casting her to live under the sea where out of anger she would destroy all ships that came near her. Today visitors to Scilla can't deny its enchantment. This beautiful village has a mystical history and a peaceful tranquility that no longer exists in the larger mainstream Italian cities. But what makes Scilla truly special is the way the coastline divides the town into two uniquely beautiful neighbourhoods. On one side you will find Marina Grande, with its beautiful 800 metre golden sand beach. While the other side Chianalea is a charming fisherman's district and where you will find some of the best seafood restaurants in Calabria. From Marina Grande walk the boardwalk to the end of the beach and notice that the coastline jags outward and heightens into a cliff. Right at the top is the ancient castle 'Castello Ruffo'. From here you can catch a great view of the coast of Sicily. On the other side of the castle lays Chianalea, the fisherman's district which is also known as 'Little Venice of the Tyrrhenian Sea'. Quaint and charming, Chianalea looks like a neighbourhood out of an old Italian film, complete with little alleyways that descent directly into the sea. It is also home to some of the best seafood restaurants in Calabria. Enjoy picturesque views of ancient fisherman's homes built right up against the sea as you dine on local seafood caught that morning. .
Scilla is only a 30 minute drive from Reggio Calabria. The town castle Castello Ruffo is open to the public from 8:30 to 19:30 and costs 1.50 Euro per person and is free for children under 9 and seniors over 70. From the castle grounds catch the marvellous view of the Eolian Islands and the Sicilian Coast. You can see a virtual tour here at Castello Ruffo Virtual Tour.